George Orwell’s last column for the New Statesman was his January 9th 1943 review of pamphlet literature. It has been popular reading since Sonia Orwell and Ian Angus made it available again in the Collected Essays, Journalism and Letters. We are more fortunate today that we can read it as it appeared, since the British Library has put online facsimiles of the two pages on which was printed. Letter to New Statesman from Quintin Hogg justifying censorship of the ABCA’s explanation of the Beveridge Report. The Army Bureau of Current Affairs was an official educational organisation, which issued a fortnightly pamphlet, Current Affairs, explaining history, geography, and current affairs. A member of a platoon, usually an officer, used the pamphlet to lead a discussion, timetabled to last one hour in work time (so the troops did not lose spare time, or choose some other activity). Other speakers were organised and welcomed by proactive officers; George Orwell sometimes spoke at ABCA events, though he found the level of education and general knowledge very low. The pamphlet issued on December 19th 1942 dealt with the recently published Social Insurance and Allied Services, now known as the Beveridge Report. It had a two page preface on how to use the document, the other ten pages are Sir William Beveridge’s “own summary of his report on Social Insurance and Allied Services”. The ABCA ultimately reported to General Sir Ronald Adam, who had read and approved the document. 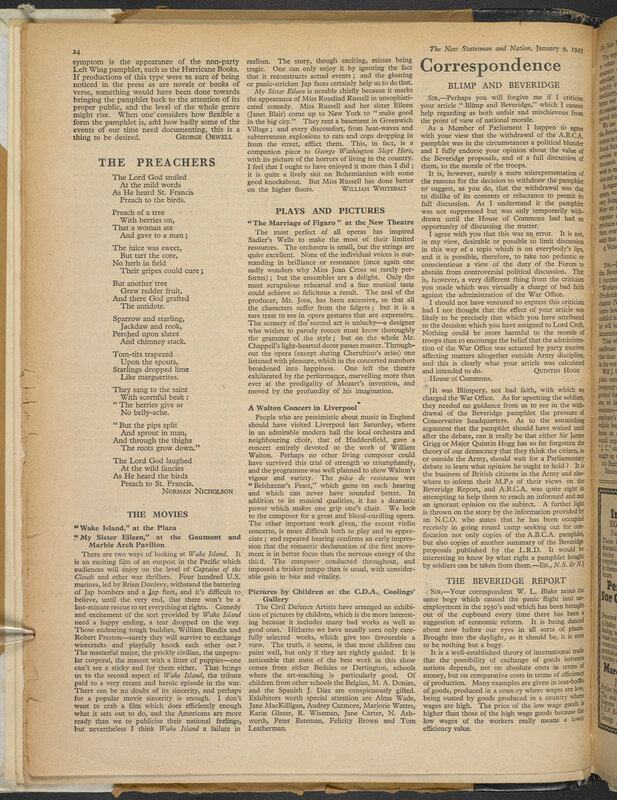 In spite of this “The pamphlet’s appearance in print provoked questions in the Commons. The minister withdrew 60,000 copies of the pamphlet, a decision approved by the War Cabinet on the grounds that the report was Beveridge’s personal conclusions, not government policy” (Broad, 133). It is this suppression that Hogg’s letter tries to justify, despite his claim that “the pamphlet was not suppressed, but was only temporarily withdrawn”. The 60,000 copies were never re-issued, contrary to Hogg’s understanding that it was “temporary”, though some have slipped through the net to reach us today. Nevertheless runs of Current Affairs almost complete, but without issue 33, seem to be common: tens of thousands of platoon pamphlet recipients never received this one. Roger Broad explains, “Six months later, a replacement pamphlet on social security [Number 45, Social Security] appeared with a closely supervised text. It included a summary of Beveridge’s report by another hand, extracts from parliamentary debates held in the meanwhile, and from Churchill’s recent broadcast on post-war reconstruction and the heavy costs that would be involved”. Orwell may never have commented on Hogg’s intervention in this affair, but his references to Hogg, whom he had known since school, were never kindly. Orwell himself always put the Beveridge Report in a wider context: seemingly good for Britain, but at a cost to the world. In late 1945 he wrote “When the Beveridge Report was first published, it had to be somewhat soft-pedalled in the news bulletins to India. There was danger that it would cause serious resentment, the likeliest Indian reaction being: ‘They are making themselves comfortable at our expense.’” (London Letter to Partisan Review, Fall 1945). Orwell and Hogg’s definitions of the distribution of wealth, though, were very different. 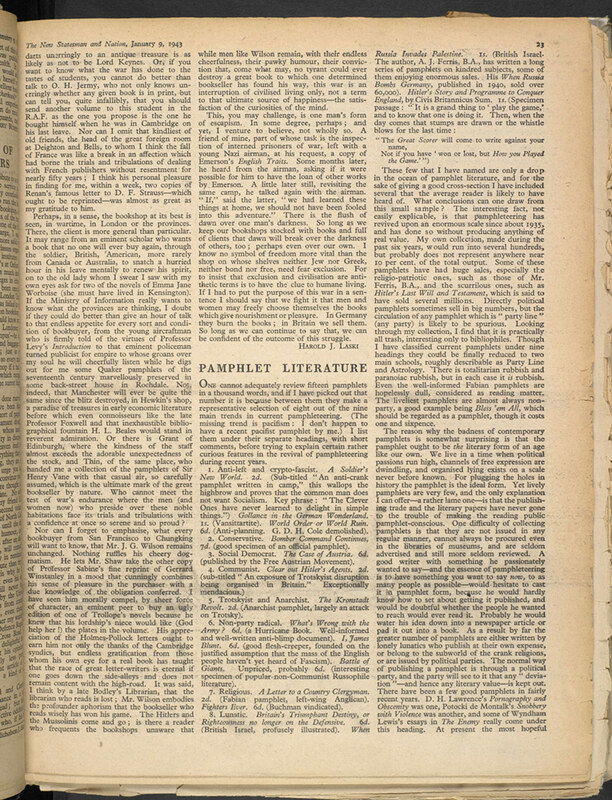 In January 1945, regarding one of Hogg’s own pamphlets, Orwell quoted, “‘Today there are only eighty people in the United Kingdom with net incomes of over six thousand pounds a year’”, and then commented “There are also about eighty ways in the English and American languages of expressing incredulity … I think and then you wake up is the exactly suitable answer to a remark like the one quoted above.” (As I Please, 19th January 1945). If anyone had spoken to him in 1943 about that second page in the New Statesman and Quintin Hogg’s letter on it, would his response have been any different?